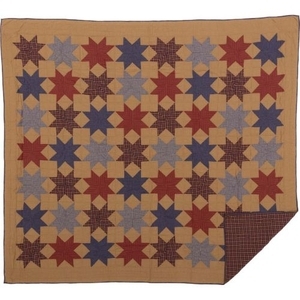 VHC Kindred Star King Quilt 95x105, Available Now! The Kindred Star Quilt blends a mustard plaid base fabric with contrasting 8-point patchwork stars in navy blue and rust red for a truly country trio. Hand quilted; stitch in the ditch; reverses to tan, red, and navy plaid. 100% cotton. Each star patch is 12x12"